A typical onsite sewage system, or septic system, is made up of several basic components: a conveyance line, a septic tank, distribution box, and a drainfield. Each component serves a unique purpose and helps to accomplish the primary goal of the onsite sewage system: to safely disperse wastewater away from a residence to help protect human and environmental health. All of the individual parts of an onsite sewage system require regular maintenance to keep the system functioning properly. Maintenance can include cleaning out your conveyance lines, pumping out your septic system, and replacing any cracked or broken components. The SepticSmart Program developed by the Environmental Protection Agency provides a wealth of resources and helpful tips for homeowners on how your septic system works and how to properly care for your system. Do your part, be Septic Smart! A conveyance, or sewer line, carries wastewater out of a home and is the starting point of the onsite sewage system. The conveyance line works by gravity to move wastewater away from a home and into the septic tank. This conveyance line has two vertical pipes used for cleaning out blockages after the pipe is covered. Some onsite sewage systems on hilly or sloped sites need a pump to move wastewater through the system. Follow the link below to learn more about pump systems. A septic tank appears simple at first glance but in actuality provides a simple and elegant means of achieving several complex actions. The septic tank’s primary job is to separate liquid and solid waste. The tank fills with liquids fairly quickly, generally in a few days to a week. Solid matter entering a septic tank slowly settles to the bottom of the tank if it’s heavier than water or floats to the top if it’s lighter than water. Fats, oils, and greases will tend to float, creating a film on top of the fluids in the tank. Some solids create problems. Vegetable material contains cellulose and is not readily digested by the bacteria in the septic tank. This causes solids to accumulate more rapidly. For this reason, garbage grinders in kitchen sinks are not recommended for homes having onsite sewage systems. Excessive hair is also potentially problematic. Hair is generally neutral in buoyancy and neither floats nor settles and presents clogging problems when present in large amounts. Most other solid matter will settle where anaerobic (without oxygen) digestion takes place. Through this process, most of the solids are converted to carbon dioxide, water and other byproducts. The process is not completely efficient and solids will accumulate over time. Watch the animation below to see how a septic tank can become clogged over time. Most septic tanks should be pumped out approximately every 4-5 years to remove the buildup of solids and ensure the tank functions properly. 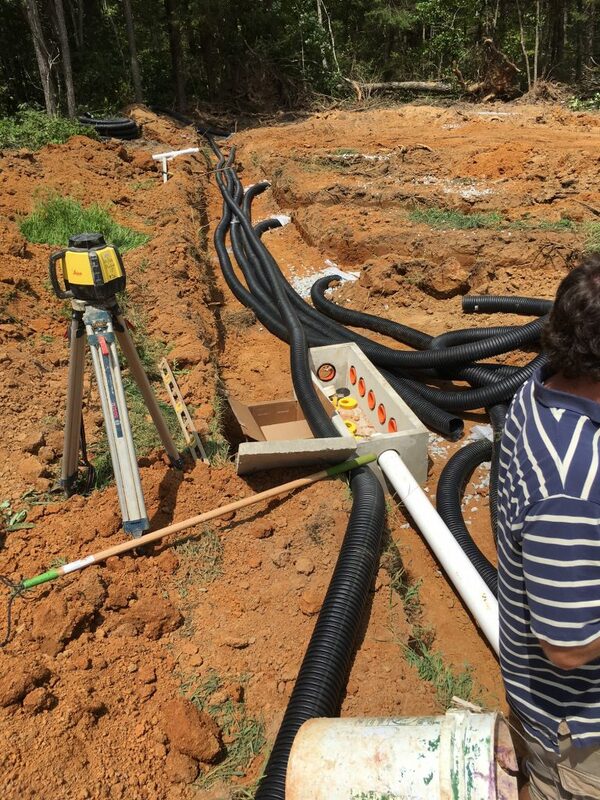 This small box, generally constructed of concrete or heavy-duty plastic, contains many pipe outlets that help evenly distribute the liquid wastewater to multiple trenches below the ground level. Equal distribution is very important so that all of the absorption trenches receive the same amount of effluent. This helps to ensure a long life for the onsite sewage system. 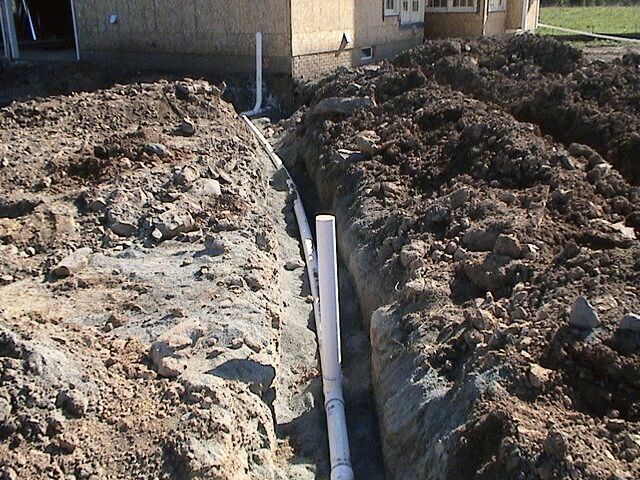 The drainfield, also known as the absorption field, is the final step in an onsite sewage system. A drainfield disperses wastewater into trenches or pads dug below the ground surface, allowing the water to percolate into the soil for final removal of nitrogen and harmful bacteria. It is very important that there is enough separation between the trench bottoms and the water level in the ground to prevent the wastewater from contaminating groundwater or surface waters. Many homes that utilize septic systems also get their drinking water from a private water well, and contaminated groundwater can quickly find its way into a drinking water source. Follow this link to learn more about private well water quality. 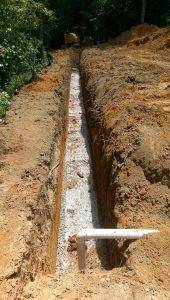 Onsite sewage system drainfield trench lined with a gravel bottom. The pipe in the foreground carries effluent from the distribution box into the trench.